TeamViewer is a very famous app for remotely controlling and troubleshooting PCs, with client apps available for Android and iOS platforms as well, allowing you to control your your computers from your phones, but not the other way round. In addition to that, the company has had its QuickSupport app available for Android for a while (initially only for Samsung devices) that allows you to remotely access, control or troubleshoot your device from a PC or another device running the TeamViewer client. The company has just brought QuickSupport to iOS and made the Android variant available for all devices. 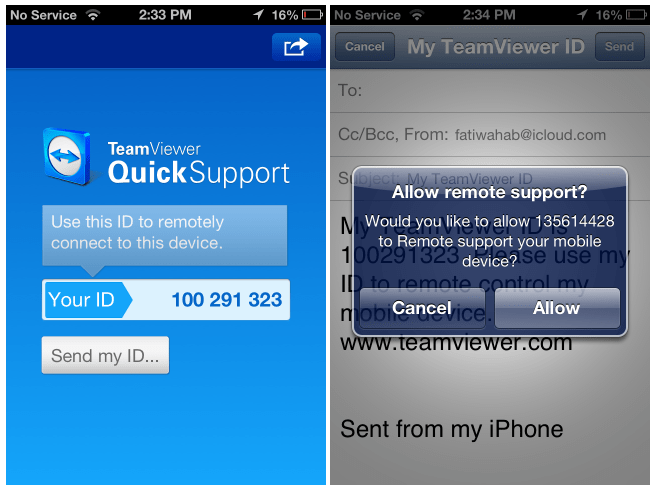 To use QuickSupport, you must have TeamViewer installed on your system. The free, non-commercial use version will work just fine. Launch QuickSupport on your iPhone and it will give you an ID number. You can enter it manually or email it to anyone by tapping the ‘Send ID’ button. Enter this key on the system you want to control your phone from and a request to connect will pop up on your device. Being the closed system that it is, iOS won’t give you complete control over the phone; however, you’ll be able to grab screenshots from your phone, transfer files, copy anything to your phone’s clipboard, send and receive messages from it, add email accounts, import iOS configuration profiles, and push WLAN settings to it. Apps can’t be launched or controlled, and neither can any of the settings, but you can get a good look at the apps and processes that are running.